A bathroom remodel can do a lot of things: add another sink, update fixtures, provide more storage, and even expand the shower to a bathroom/shower combo. It’s perfect for someone living alone or even a couple. But that bathroom can get awful small once children come along or friends and family come for an extended visit. An additional bathroom, however, may check off all the boxes for a growing family. It could be a master suite addition, a new bathroom for the kids to use, or even a half bath to handle the – for lack of a better term – overflow. An added bonus? The existing bathroom will remain operational instead of disrupting day-to-day operations. Hoping no one beats you to the bathroom on a cold morning becomes a thing of the past with a master en suite bathroom. If this is an addition, there is also the luxury of designing it to fit your needs. Separate shower and bathtub, double vanities, and even a towel warming drawer are all possible. Don’t forget a heated floor for those cold mornings. When adding a master bathroom, there are a few things to consider: will this be taking square footage away from another room, or will this be added square footage? The answer to this question will play a big part in how the bathroom is designed. Either way, Designers NW will build you the bathroom of your dreams, your own private retreat from the hectic world. 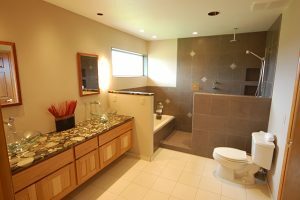 Adding a bathroom to the basement or to an upper floor, or expanding an existing bathroom, all have their own unique design questions. As a family grows, the need for a second (or even third?) bathroom grows right along with it. Adding a bathroom to the basement or to an upper floor, or expanding an existing bathroom, all have their own unique design questions. A full basement bathroom may need foundation work, new plumbing, heating and framing. When expanding an existing bathroom, the extra square footage will need to come from someplace, even if you need to expand out to the yard. A second floor bathroom not only needs to find the space, but additional support if a bathtub will be used. Even though it will take a lot of thought, design and work, the finished product will give your family the extra bathroom it needs. No more hogging the shower, elbowing for a place at the sink, or waiting for your turn to use the bathroom at all. Contact Designers NW to talk about your bathroom needs and how we can solve your square footage problems. Are all the bathrooms located upstairs? Instead of making guests make the trek to the second floor, why not add a half-bath to the main floor for convenience? Depending on the design, a powder room can take up no more than 20 square feet of real estate in your home. This small addition, however, will provide your guests a place to wash up before dinner without having to walk through the entire house and give your family one more restroom to alleviate the morning rush. No matter what you want or need in a new bathroom, Designers NW can bring your dream to reality. Contact us today to talk about the possibilities.